Tibetan Buddhism is the body of religious Buddhist doctrine and institutions characteristic of Tibet and the Himalayan regions which include northern Nepal, Bhutan, India (Arunachal Pradesh, Ladakh and Sikkim), areas in northern Pakistan, Mongolia, Russia (Kalmykia, Buryatia and Tuva) and northeastern China (Manchuria: Heilongjiang, Jilin). It includes the teachings of the three vehicles (or yanas in Sanskrit) of Buddhism: Hinayana, Mahayana, and Vajrayana. The earliest well-documented influence of Buddhism in Tibet dates from the reign of king Songtsän Gampo, the first emperor of a unified Tibet, who married a Chinese Buddhist princess, Wencheng, a niece of the powerful Emperor Taizong of Tang in 641 and founded the first Buddhist temples in Tibet. In the eighth century, Tibetan King Khri srong lde btsan (742–797) established Buddhism as the official religion of the state and invited Indian and Chinese Buddhist scholars to his court. According to the Tibetan tradition, the famous tantric mystic Padmasambhava arrived in Tibet during his reign and merged tantric Buddhism with the local Bön religion. In addition to writing a number of important scriptures, Padmasambhava established the Nyingma school from which all schools of Tibetan Buddhism are derived. By the middle of the twelfth century, the major sects of Tibetan Buddhism had emerged. By the fourteenth century, the Tibetans had translated all the available Buddhist literature in India and Tibet; many lost Sanskrit texts are known only by their Tibetan translations. 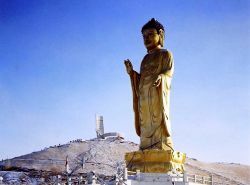 The annexation of Tibet by the People's Republic of China in 1959, which resulted in the Tibetan diaspora, eventually led to the spread of Tibetan Buddhism to many Western countries where the tradition has gained great popularity. Tibetan Buddhist is a distinctive form of Buddhism that began evolving in the seventh century C.E. in Tibet. 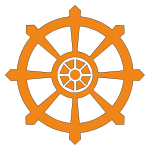 Though based primarily on Madhyamika and Yogacara philosophy, it utilizes the symbolic ritual practices of Vajrayana (Tantric Buddhism) and incorporates the monastic disciplines of early Theravada Buddhism and features of the indigenous Tibetan religion, Bon. It is characterized by “reincarnating lamas,” (religious leaders), the participation of a large segment of the population in religious and monastic disciplines, the rule of the Dalai Lama as both a spiritual and temporal authority, and reverence for a large body of divine beings. Tibetan Buddhism is a Mahayana Buddhist tradition, meaning that the goal of all practice is to achieve enlightenment (or “Buddhahood”) in order to help all other sentient beings attain this state, as opposed to mere personal liberation. The motivation for Mahayana practice is Bodhicitta (Ch. 菩提心, pudixin, Jp. bodaishin, a Sanskrit word meaning 'mind of enlightenment')—the altruistic intention to become enlightened for the sake of all sentient beings. “Buddhahood” is defined as a state of omniscience (sarvajñä) that is free from the obstructions to liberation (negative states of mind such as ignorance, hatred and desirous attachment) and the obstructions to omniscience (which are the imprints or 'stains' of delusions imagining inherent existence). Freed from mental obstacles, a person is said to attain a state of continuous bliss mixed with a simultaneous cognition of the true nature of reality, where all limitations on the ability to help all other living beings are removed. This includes the attainment of omniscience, the removal of all obstructions to knowledge of all phenomena (understanding the empty nature of each phenomenon, as well as each of its relative characteristics). From the perspective of Tibetan Buddhism, when a person conceives of a particular object, the mind gives rise to the appearance of that object. In perceiving the empty nature of all phenomena as well as each of their relative characteristics, a person becomes both omniscient and omnipresent. There are said to be countless beings that have attained Buddhahood, who spontaneously, naturally and continuously perform activities to benefit all sentient beings. However it is believed that sentient beings' karma (or 'actions') limit the ability of these Buddhas to help them. Thus, although Buddhas possess no limitation on their ability to help others, sentient beings continue to experience suffering as a result of the limitations placed on them by their own negative actions. Tibetan Mahayana Buddhism encompasses Vajrayana Buddhism, also known as Tantric Buddhism, Tantrayana, Mantrayana, Mantranaya, Esoteric Buddhism, Diamond Vehicle, or 金剛乘 Jingangcheng in Chinese; however, these terms are not always regarded as equivalent. Vajrayana is a Sanskrit word, a conjunction of vajra which may be translated as “diamond,” “thunder” or “indestructible” and yana, or “vehicle.” It is said that Vajrayana practice is the fastest method for attaining Buddhahood, allowing a person to attain enlightenment in a single lifetime instead of through numerous rebirths. However, this experience of enlightenment has a solid and reliable grounding in the preliminary practices of renunciation, Bodhicitta and Wisdom - specifically, the realization of emptiness. The practice of Vajrayana is an esoteric teaching, which can be accomplished only within the relationship between a student and his master, usually a qualified lama. Nyingma(pa), The Ancient Ones, the oldest and original order founded by Padmasambhava( Ch: 蓮華生上師), a Tibetan master, and relies on very early esoteric scriptures known as tantras. In this school there is a good deal of emphasis placed on meditation. Founded by Padmasambhava, this is oldest sect, noted in the West for the teachings of the Tibetan Book of the Dead. Kagyu(pa), Oral Lineage, has one major subsect and one minor subsect. The first, the Dagpo Kagyu, encompasses those Kagyu schools that trace back to Gampopa. In turn, the Dagpo Kagyu consists of four major sub-sects: the Karma Kagyu, headed by the Karmapa, the Tsalpa Kagyu, the Barom Kagyu, and Pagtru Kagyu; as well as eight minor sub-sects, all of which trace their root to Pagtru Kagyu. Among the eight sub-sects the most notable of are the Drikung Kagyu and the Drukpa Kagyu. 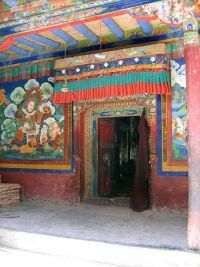 The once-obscure Shangpa Kagyu, which was famously represented by the twentieth century teacher Kalu Rinpoche, traces its history back to the Indian master Niguma, sister of Kagyu lineage holder Naropa. This is an oral tradition which is very much concerned with the experiential dimension of meditation. Kagyupa: Founded by Tilopa [988-1069), the Kagyupa tradition is headed by the Karmapa Lama. Its most famous exponent was Milarepa, an eleventh century mystic who meditated for many years in mountain caves before eventually reaching enlightenment; other important Kagyupa teachers include Naropa and Marpa. Sakya(pa), Grey Earth, headed by the Sakya Trizin, founded by Khon Konchog Gyalpo (Gonchok Gyelpo; 1034-1102), a disciple of the great translator Drokmi Lotsawa, and his son, Gunga Nyingpo (1092-1158). Sakya Pandita (1182–1251) was the great grand-son of Khon Konchog Gyalpo. This school very much represents the scholarly tradition. Gelug(pa), Way of Virtue, also known as Yellow Hats, whose spiritual head is the Ganden Tripa and whose temporal head is the Dalai Lama, who was ruler of Tibet from the mid-17th to the mid-twentieth century. It was founded in the fourteenth to fifteenth century by Je Tsongkhapa (Tsong Khapa Lobsang Drakpa, Je Rinpoche; 1357 - 1419), based on the foundations of the Kadampa tradition. 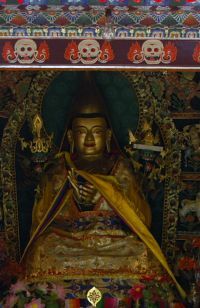 Tsongkhapa was renowned for both his scholasticism and his virtue. The Dalai Lama belongs to the Gelukpa school and is regarded as the embodiment of Chenrezig, the Bodhisattva of Compassion (the equivalent of Avalokitesvara). The schools are sometimes divided into the "Old Translation," or Nyingma, and "New Translation" (Sarma) traditions, with the Kagyu, Sakya and Kadam/Gelug among the Sarma They are also sometimes classified as "Red Hat" and "Yellow Hat" schools, with the Nyingma, Kagyu and Sakya among the former and the Gelug comprising the latter. The terms "Old Translation" and "New Translation" particularly designate translations and lineages of various Tantric texts. Besides the four main schools, there are a number of minor ones like Jonang, Zhije, Bodong and Buton. The Jonangpa were suppressed by the rival Gelukpa in the 1600s and were once thought extinct, but are now known to survive in Eastern Tibet. The Bön religion, which predated Buddhism in Tibet, has now been formally honored by the Dalai Lama as the fifth religious tradition of Tibet. Bön practitioners honor Tonpa Shenrab Miwoche as their founder instead of Shakyamuni Buddha. Vaibhasika (Tib. bye-brag smra-ba), primarily based on is the Abhidharmakosha by Vasubandhu and commentaries. Sautrantika (Tib. mdo-sde-pa) The Sautrāntika school of Buddhism split from the Sarvāstivādins sometime between 50 B.C.E. and c. 100 C.E.. The Sautrāntikas spurned the Abhidharma literature in favor of the original sutras of the canon. They used the concept of an āśraya (substrate, refuge) where the Pudgalavādins and the Vātsiputrīya school posited a pudgala (person) and where mainstream Indian philosophy typically referred to an ātman (self, soul). Dignaga and Dharmakirti were their most prominent exponents. Yogacara (Sanskrit: "yoga practice," also spelled yogāchāra), also called Cittamatra (Tib. sems-tsam-pa), Mind-Only, an influential school of philosophy and psychology, emphasizing meditative practice, developed in Indian Mahayana Buddhism circa fourth century C.E.. The Yogācāra School developed and embodied what is known as the consciousness-only or mind-only doctrine (Sanskrit: cittamātra). Yogācāra is also sometimes referred to as the "Knowledge Way." Yogacarin base their views on texts from Maitreya, and Asanga and Vasubandhu, who] are regarded as the founders of this school. Madhyamikas base their views on Nagarjuna and Aryadeva. Acharya Nāgārjuna (Telugu: నాగార్జున; Chinese: 龍樹; Tibetan: Klu Sgrub) (c. 150 - 250 C.E.) was an Indian philosopher whose writings were the basis for the foundation of the Madhyamaka (Middle Way, Middle Path) school of Mahāyāna Buddhism, which was transmitted to China under the name of the Three Treatise (Sanlun) School. He is credited with developing the philosophy of the Prajnaparamita sutras. Aryadeva (3rd century C.E. ), was a disciple of Nagarjuna and author of several important Mahayana Madhyamaka Buddhist texts. He is also known as Kanadeva the 15th patriarch in the Zen tradition, and Bodhisattva Deva in Shri Lanka where he was born as the son of a king. It is not clear, if these four streams ever actually existed as distinct traditions in India or if this classification was introduced by Tibetan Scholars only after the transmission to Tibet. The tenet system is used in the monasteries and colleges to teach Buddhist philosophy in a systematic and progressive fashion, each philosophical view being more subtle than its predecessor. The four schools can be seen as a gradual progression from a relatively easy to grasp, "realistic" philosophical point of view to more and more complex and more subtle views on the ultimate nature of reality, and on concepts such as emptiness and dependent arising , culminating in the philosophy of the Madhyamikas, which is widely believed to present the most sophisticated point of view. The doctrine of Dependent Arising (Pratītyasamutpāda; Sanskrit: प्रतीत्यसमुत्पाद) or Paticcasamuppāda (Pāli: पतिचसमुपादा; Tibetan: rten.cing.'brel.bar. 'byung.ba; Chinese:緣起) is an important part of Buddhist metaphysics. Common to all Schools of Buddhism, it states that phenomena arise together in a mutually interdependent web of cause and effect. It is variously rendered into English as "dependent origination," "conditioned genesis," "dependent co-arising," or "interdependent arising." Although there were many householder-yogis in Tibet, monasticism was the foundation of Buddhism in Tibet. It is estimated that in the period from the sixteenth century through to the Chinese invasion in 1959 as much as 25 percent of the population of Tibet were monks. In Mongolia during the 1920s, approximately one third of the male population were monks, though many lived outside monasteries. These monasteries were largely dismantled during Communist rule, but many have been reestablished with the Buddhist revival in Mongolia. According to a Tibetan legendary tradition, Buddhist scriptures (among them the Karandavyuha Sutra) and relics (among them the Cintamani) arrived in southern Tibet during the reign of Lha Thothori Nyantsen, the 28th "king of Tibet" (fifth century), who was probably a local chief in the Yarlung valley. The tale is miraculous (the objects fell from the sky onto the roof of the king's palace), but it may have a historical background linked to the arrival of Buddhist missionaries. The earliest well-documented influence of Buddhism in Tibet dates from the reign of king Songtsän Gampo (Srong-btsan sGam-po, “he who is powerful, just and profound;” 605 or 617? - 649), the first emperor of a unified Tibet, who married a Chinese Buddhist princess, Wencheng. Songtsän Gampo Srong-btsan sGam-po =) According to a Tibetan legendary tradition, he also married a Nepalese Buddhist princess, Bhrikuti; but Bhrikuti, who bears the name of a goddess, is not mentioned in reliable sources. The Chinese Princess Wencheng (Tibetan: Mung-chang Kungco, (Traditional Chinese: 文成公主, pinyin: Wénchéng Gōngzhǔ) (d. 680), was a niece of the powerful Emperor Taizong of Tang of Tang China, and according to Chinese records, left China in 640, arriving the next year in Tibet to marry Songtsän Gampo, the thirty-third king of the Yarlung Dynasty of Tibet, in a marriage of state as part of a peace treaty. She is popularly known in Tibet as Gyasa. Songtsän Gampo founded the first Buddhist temples in Tibet. By the second half of the eighth century he was already regarded as an embodiment of the bodhisattva Avalokiteshvara. The successors of Songtsän Gampo seem to have been less enthusiastic about the propagation of Buddhism. But in the eighth century, emperor Trisong Detsen (755-797) established Buddhism as the official religion of the state and invited Indian Buddhist scholars to his court. According to the Tibetan tradition, the famous tantric mystic Padmasambhava arrived in Tibet during his reign. 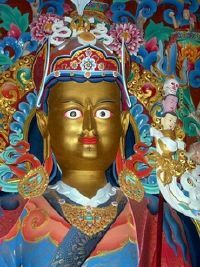 It was Padmasambhava (more commonly known in the region as Guru Rinpoche) who merged tantric Buddhism with the local Bön religion to form what we now recognize as Tibetan Buddhism. In addition to writing a number of important scriptures (some of which he hid for future tertons to find), Padmasambhava established the Nyingma school from which all schools of Tibetan Buddhism are derived. Chinese Ch'an (Zen) Buddhism was introduced to the Nyingmapa in three principal streams: the teachings of Master Kim, Kim Ho-shang, (Chin ho shang) 金和尚 transmitted by Sang Shi in c. 750 C.E. ; the lineage of Master Wu Chu, 無住 of the Pao T'ang School was transmitted within Tibet by Ye shes dbang po; and the teachings from Mo Ho Yen, 和尚摩訶衍 (Tibetan: Hwa shang Mahayana) that were a synthesis of the Northern School of Ch'an and the Pao T'ang School. Tibetan King Khri srong lde btsan (742–797) invited the Ch’an master Mo-ho-yen (whose name consists of the same Chinese characters used to transliterate “Mahayana”) to transmit the Dharma at Samye Monastery. Mo-ho-yen had been disseminating Dharma in the Tun-huang locale, but lost an important philosophical debate on the nature of emptiness to the Indian master Kamalashila, and the king declared Kamalashila's philosophy should form the basis for Tibetan Buddhism. Buddhism was suppressed under the politically unstable rule of King Langdarma (r. 838 – 841). A new king by the name of Lha Lama Yeshe Yod, however, was a strict believer in Dharma and sent his academic followers to learn and translate some of the Sanskrit Buddhist texts. Among these academics was Nagtso, who was eventually sent to Vikramasila college to study Sanskrit and plead with the great teacher Atisha (982 – 1054) to come teach the Dharma in his homeland. With his arrival in Tibet, a reform movement began, and by the middle of the twelfth century, the major sects of Tibetan Buddhism had emerged. According to Jamgon Kongtrul, when Atisha arrived in Tibet and discovered the store of Sanskrit texts at Pekar Kordzoling, the library of Samye, "he said that the degree to which the Vajrayana had spread in Tibet was unparalleled, even in India. After saying this, he reverently folded his hands and praised the great dharma kings, translators, and panditas of the previous centuries." By the fourteenth century, the Tibetans had translated all the available Buddhist literature in India and Tibet; many lost Sanskrit texts are known only by their Tibetan translations. The Tibetan canon is divided into the Bka'-'gyur (Translation of the Word), consisting of the supposedly canonical texts; and the Bstan-'gyur (Transmitted Word), consisting of commentaries by Indian masters. From the seventeenth century until 1959, when the hierocratic government of the Dalai Lama was abolished by the People's Republic of China the Gelug(pa), Way of Virtue, also known as Yellow Hats, were predominant, and the Dalai Lama was ruler of Tibet. Today, Tibetan Buddhism is adhered to widely in the Tibetan Plateau, Nepal, Bhutan, Mongolia, Kalmykia (on the north-west shore of the Caspian), Siberia (central Russia, specifically Buryatia and Chita Oblast), and the Russian Far East (concentrated in Tyva). The subjugation of Tibet to Chinese Communist rule sent many refugees, including highly respected tulkus (reincarnated lamas) to other parts of the world. In the wake of the Tibetan diaspora, Tibetan Buddhism has gained adherents in the West and throughout the world; there are estimated to be tens of thousands of practitioners in Europe and the Americas. Western celebrity Tibetan Buddhism practitioners include Richard Gere, Adam Yauch, Allen Ginsberg; Philip Glass, and Steven Seagal (who has been proclaimed a tulku). In the past, Tibetan Buddhism was referred to by some westerners as "Lamaism" but this is now considered by many to be based on a misunderstanding of the practice of guru yoga ('guru' is the Sanskrit equivalent of the Tibetan word 'lama' which means 'spiritual teacher') in Tibetan. ↑ Vajrayana may be cognate with Tantrayana, Mantrayana, etc. amongst many other renderings; though scholars and specific traditions often employ terms in specific ways with particular denotations. There are no true synonyms in English as in every other language. ↑ C.I. Beckwith, "The revolt of 755 in Tibet," in The History of Tibet, ed. Alex McKay, (Vol. 1, London: 2003), 273-285 (discusses the political background and the motives of the ruler). ↑ Robert Zim, "Basic ideas of Yogacara Buddhism", San Francisco State University 1995. Retrieved April 16, 2018. ↑ Alexander Studholme, The Origins of Om Manipadme Hum: A Study of the Karandavyuha Sutra (Albany, NY: State University of New York Press, 2002), 14. ↑ Thubten Jigme Norbu, and Colin Turnbull, Tibet: Its History Religion and People. (original 1968 Reprint ed. (1987) Penguin Books), 142. ↑ Zizhi Tongjian, vol. 202. ↑ Keith Dowman, The Power-places of Central Tibet: The Pilgrim's Guide (New York: Routledge & Kegan Paul, 1988, ISBN 0710213700), 41. ↑ Alexander Macdonald, "Religion in Tibet at the time of Srong-btsan sgam-po: myth as history," in The History of Tibet, ed. Alex McKay, Vol. 1, (London: 2003), 354-363 (for the queens see p. 355); Eva Dargyay, "Srong-btsan sgam-po of Tibet: Bodhisattva and king," in The History of Tibet, ed. Alex McKay, Vol. 1, (London: 2003), 364-378 (for the queens see p. 373). ↑ Sang Shi later became an abbot of Samye Monastery. ↑ A. W. Barber, "The Unifying of Rdzogs Pa Chen Po and Ch'an", Chung-Hwa Buddhist Journal 3 (April 1990): 301-317. Retrieved April 16, 2018. ↑ Zuihō Yamaguchi, "The Core Elements of Indian Buddhism Introduced into Tibet: A Contrast with Japanese Buddhism the Zen Site. Retrieved April 16, 2018. ↑ Tulku Ringu and Ann Helm, The Ri-Me Philosophy of Jamgon Kongtrul the Great: A Study of the Buddhist Lineages of Tibet (Boston: Shambhala Publications, 2006), 74. ↑ Statement by H.H. Penor Rinpoche, Statement by H.H. Penor Rinpoche Regarding the Recognition of Steven Seagal as a Reincarnation of the Treasure Revealer Chungdrag Dorje of Palyul Monastery. Retrieved April 16, 2018. 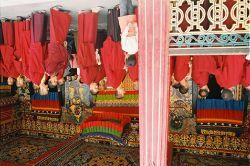 LamRim.com - Tibetan Buddhist Internet Radio. Lama Yeshe Wisdom Archive - free books. This page was last modified on 25 July 2018, at 23:28.